For pretty much the whole month of December, our flat has oozed with smells of cinnamon and orange, partly thanks to The White Company's 'Winter' candle which I was burning solidly throughout the month. 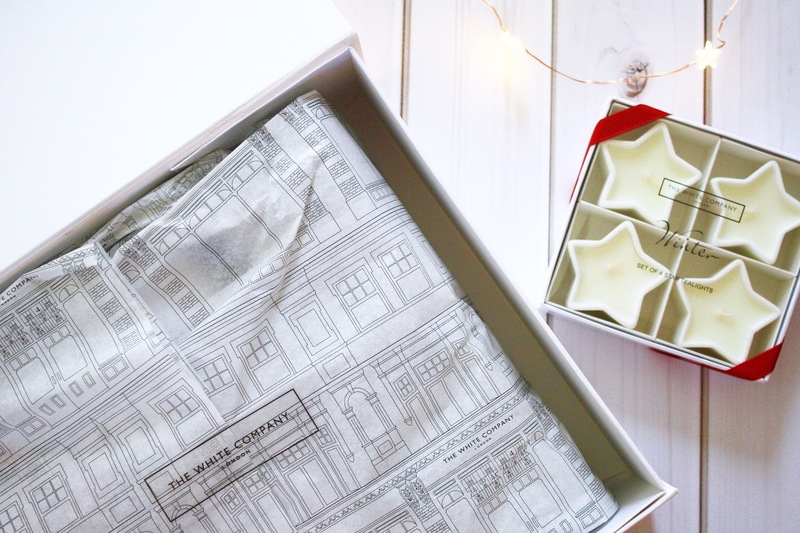 For Christmas I was very grateful to receive their 'Mini Home Scenting Set' and a set of star-shaped tealights in their Winter scent from my parents. The set itself comes with a diffuser, votive candle and a room spray which I literally couldn't wait to use. I've been spritzing the room spray around the flat and it has smelt SO good in here each day. 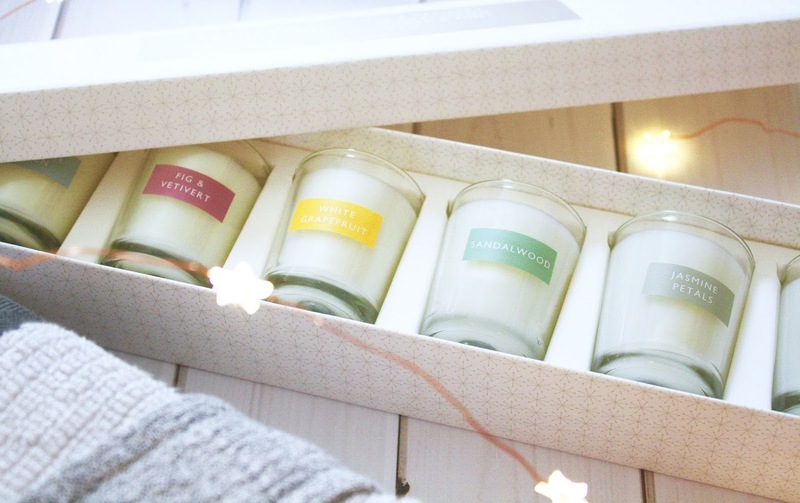 If you're a lover of their Winter scent, this set is an absolute dream, and the tealights are so cute on display too. 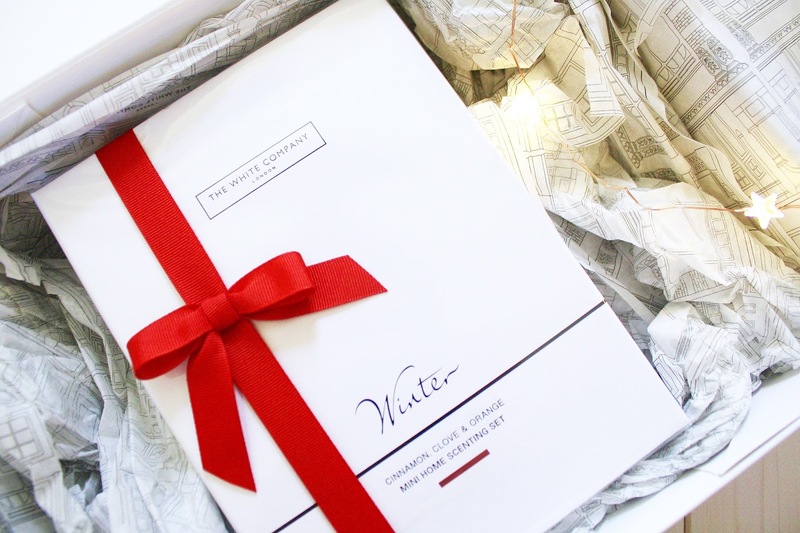 Oh, and the gift wrapping is just GORGEOUS - I was a bit obsessed with the tissue paper it came beautifully wrapped in. Before we set off to my parents on Christmas Day, Alex gifted me one of my presents a little early. He got me a beautiful scarf from Laura Ashley which I wore travelling to and from my parents' as it was pretty darn chilly on Christmas Day. I love scarves and my collection is ever-growing, particularly since Christmas which you will start to see in this post. The scarf he gifted me is so soft and snuggly. It is a mix of pale white and cream tones and tartan-printed too. I can't wait to dress up my outfits with this throughout the colder months and it will definitely brighten up my mostly black outfits. One fragrance that I continually go back to is Chanel's 'Chance'; it's the most lovely fragrance and it's super sweet & feminine. 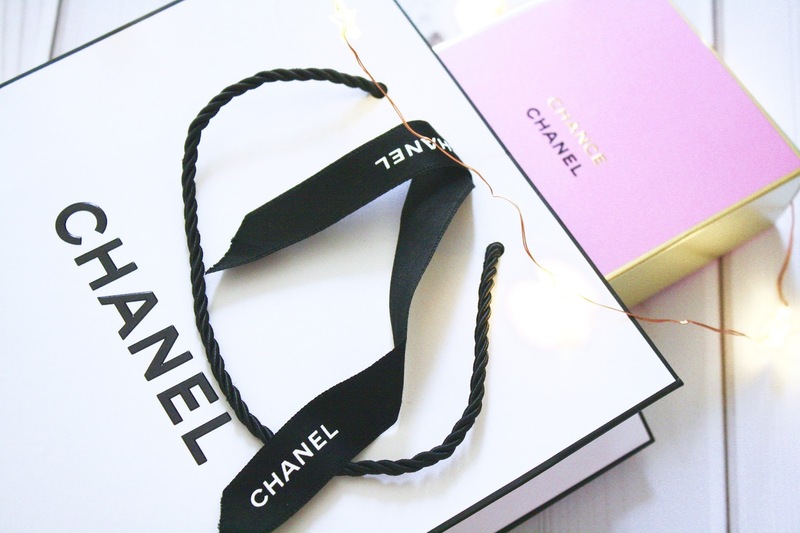 I really don't think you can go wrong with a Chanel perfume and I was so grateful to receive this for Christmas. 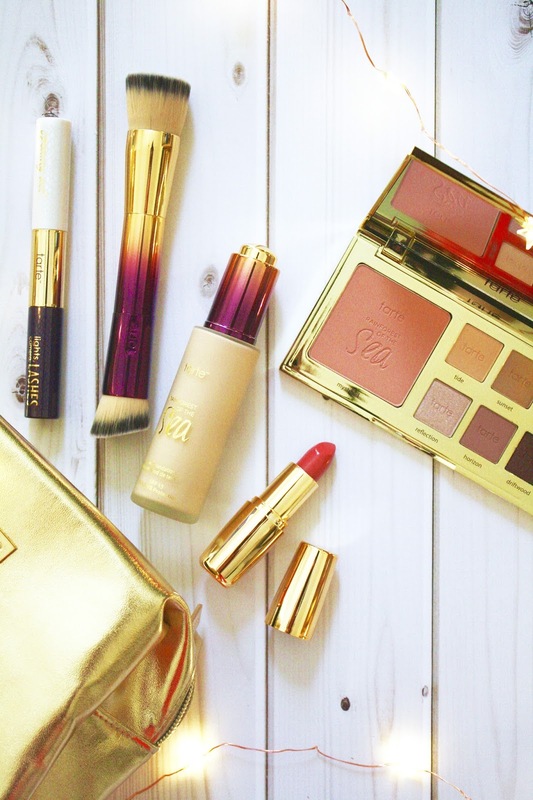 How dreamy is their packaging too? Gosh, I will start by saying I was a little overwhelmed when I received this present. 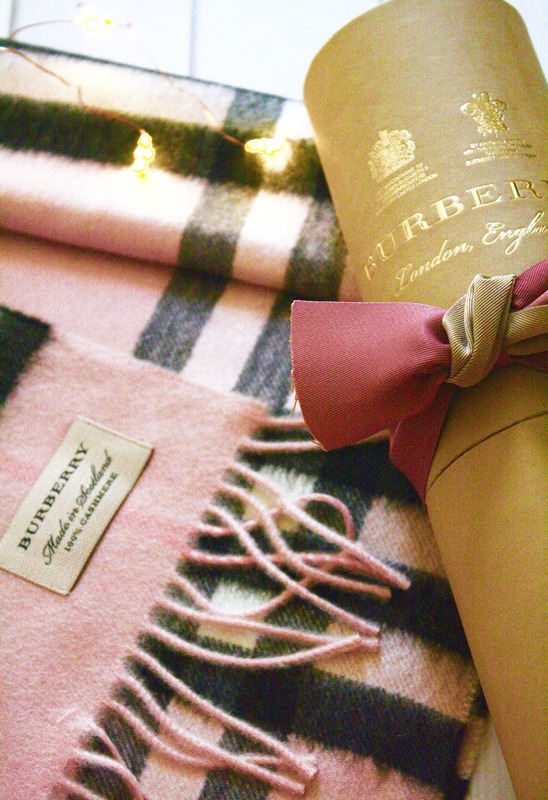 My brother gifted me the most beautiful Burberry scarf and it was an absolute shock to me when I carefully pulled back the wrapping paper to see the Burberry logo printed on the tube inside. Before I opened the tube, I genuinely thought it was going to be filled with some sort of swanky shortbreads and I was definitely mistaken, aha! This is the first real designer piece of clothing I've owned. The scarf itself is a gorgeous tartan mix of pink, white and black colouring and it is the softest thing I have ever felt. It's safe to say that I will treasure this rest of my life and I am beyond grateful to have received such a lovely gift. Thank you millions, Bro! 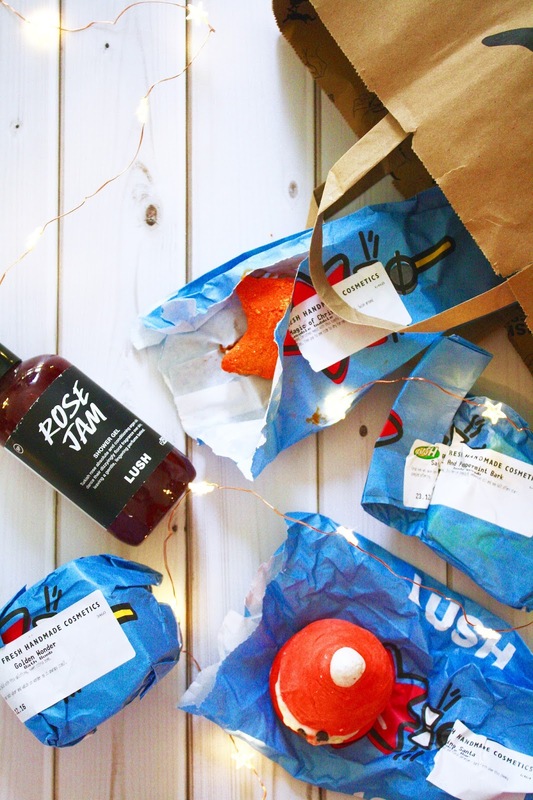 Is it even Christmas without Lush products? 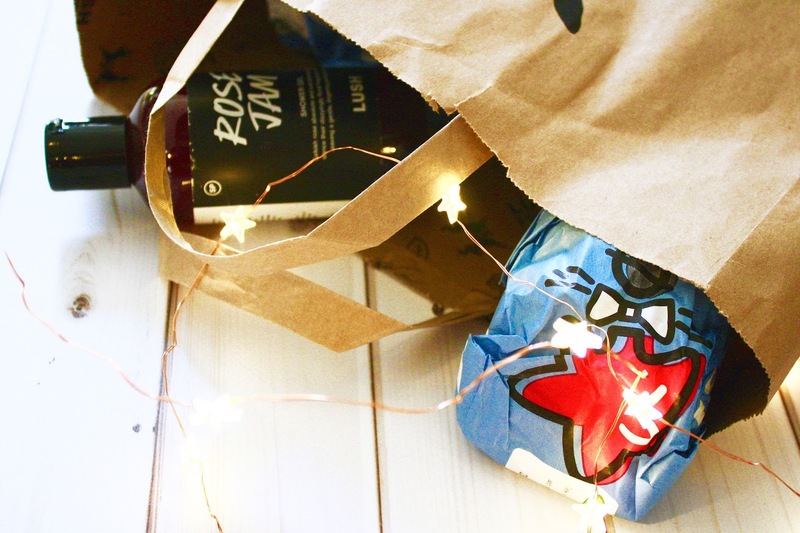 I was so excited to see a Lush bag under the Christmas tree as I hadn't actually bought any items from their festive range this year. I very kindly received their Rose Jam shower gel (which I have now been using EVERY day) and their 'Golden Wonder' & 'Peeping Santa' bath bombs, along with the 'Magic of Christmas' bubble wand and the 'Salt and Peppermint Bark' body scrub. 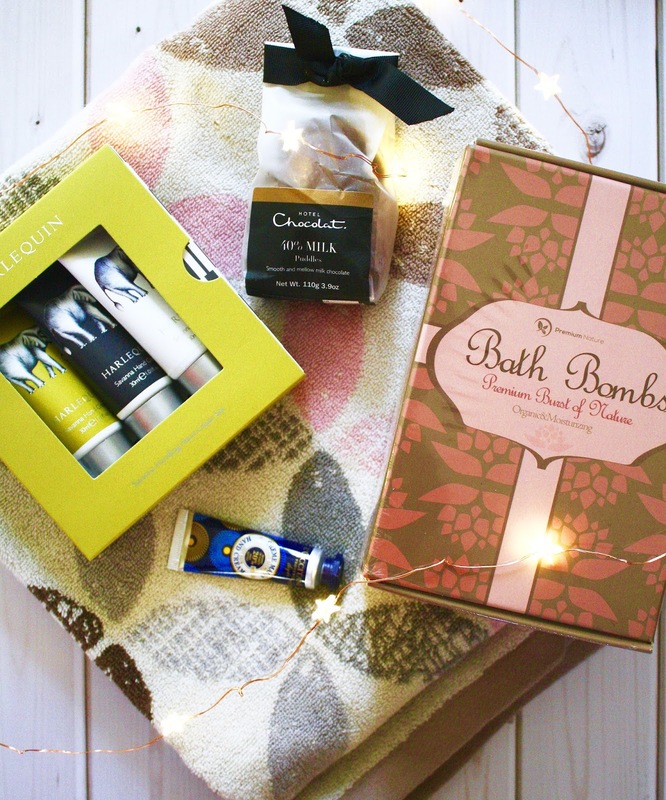 These goodies will make Christmas last just a little bit longer for me and I'm looking forward to coming home to some lovely baths after long days at work for the next few weeks. 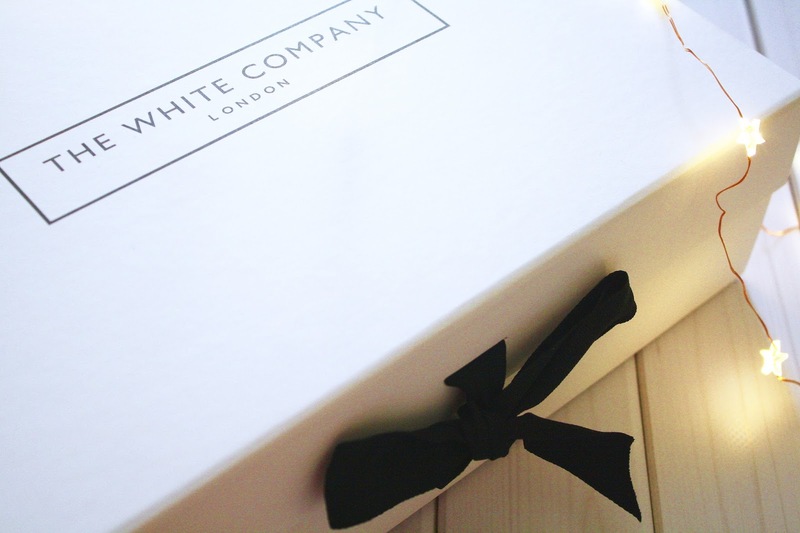 To help with my pampering sessions, my boyfriend gave me a super snuggly cotton bath robe and a set of delicately-scented mini candles. 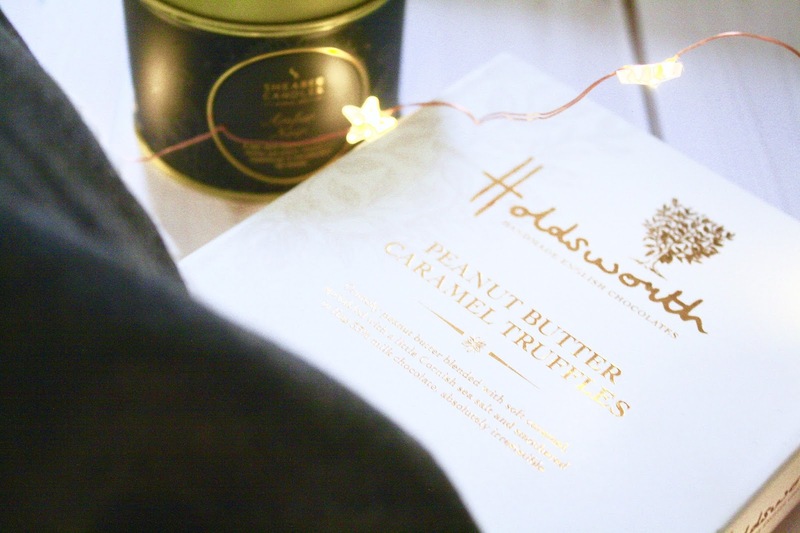 So far I've tested out the 'Sandalwood' candle and I love its delicate fragrance - it's the perfect scent for some chill time in the evening and I can't wait to give the others a whirl too. Along with these, I received some super cute Primark festive leggings from my parents which I love to lounge in each Christmas. 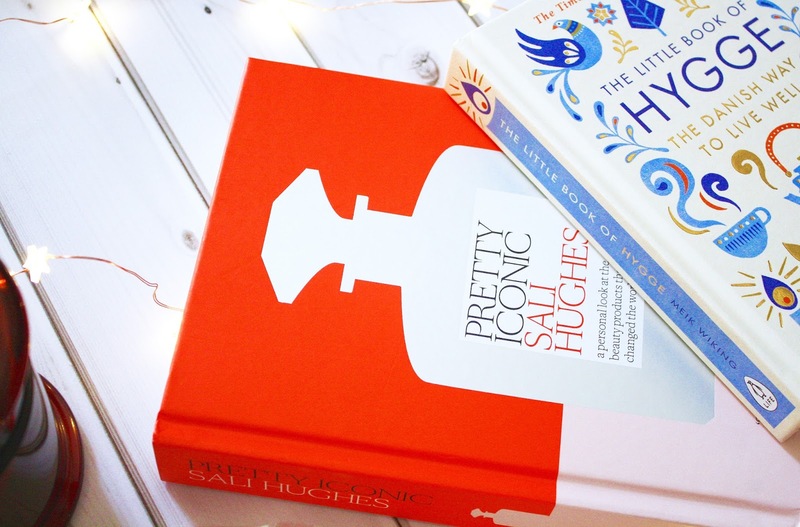 I really love giving and receiving books as presents and I was so pleased to have received 'Pretty Iconic' by Sali Hughes and 'The Little Book of Hygge' by Meik Wiking. Both books make for gorgeous coffee table books and I'm looking forward to cosying down on the sofa under a blanket and getting started on reading this pair. I actually even gave my Mum her own copy of 'Pretty Iconic' and I was excited to receive one back for Christmas too! Along with this, my family also gave me a Mulled Wine scented candle from Next which has been constantly burning in my living room to keep the 'festive feels' going in my flat and I received some gummy sweets too which I'm looking forward to having. 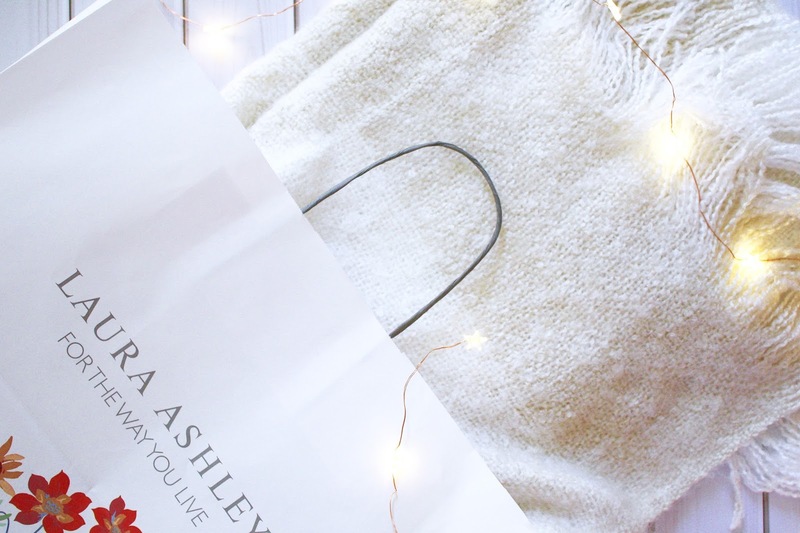 Every Christmas, I fall in love with Cath Kidston's Christmas print, and this year was no exception. 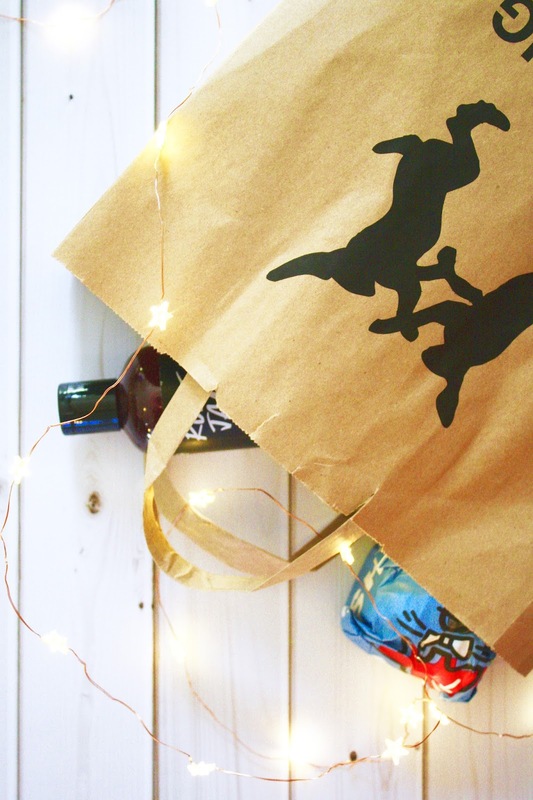 I received some gorgeous bits from their collection last year, which I posted in my 'What I Got for Christmas 2015' blog post, and I was excited to add these cute homewares to my collection this year. 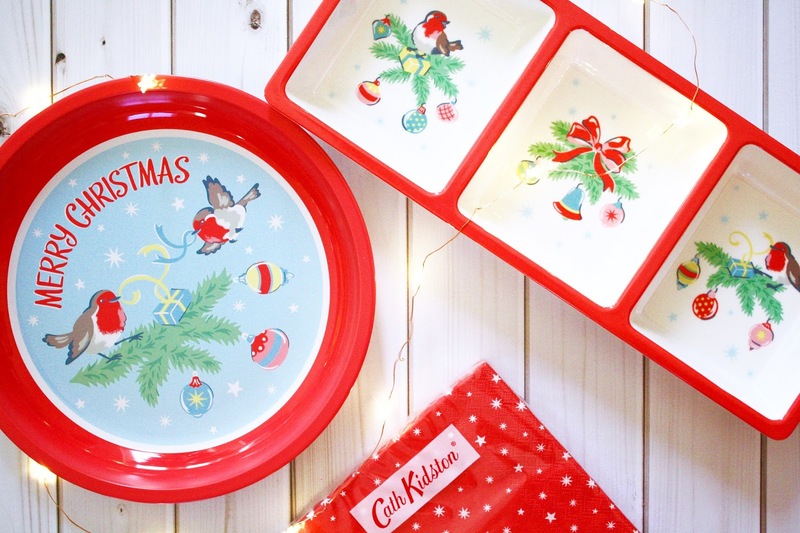 How cute are the robins on this year's kitchenware? 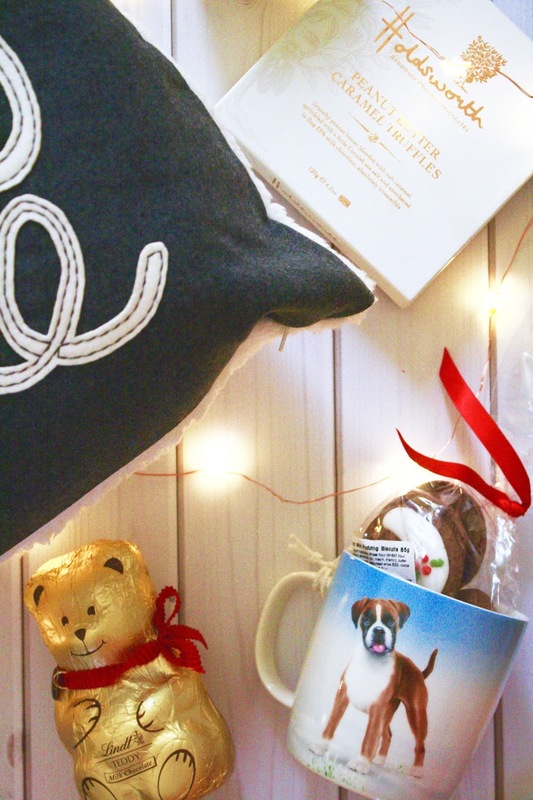 Lastly I received some more home comfort kinda gifts from my family including chocolates (which needless to say are almost gone already...), a Buster the Boxer mug (Alex got a matching one too! 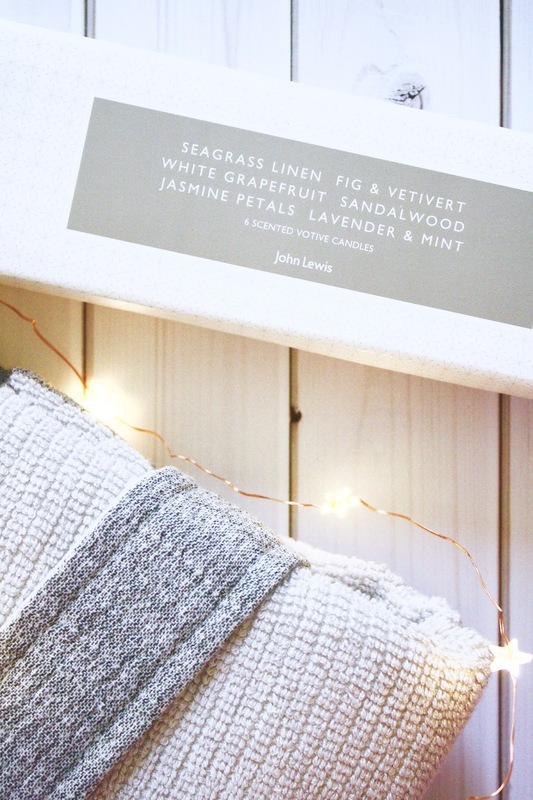 ), another lovely candle which I have burning as we speak and a gorgeous cushion from Next. 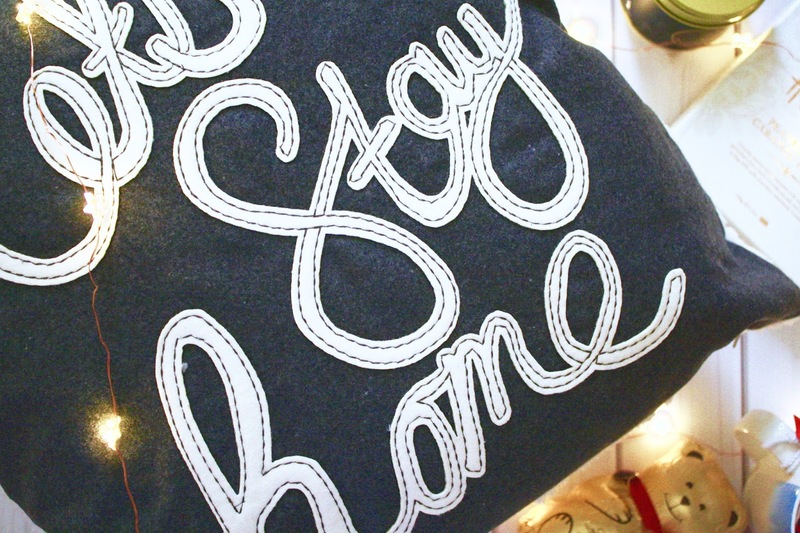 I actually spotted this cushion whilst I was out Christmas shopping a few weeks back and I fell in love with it. 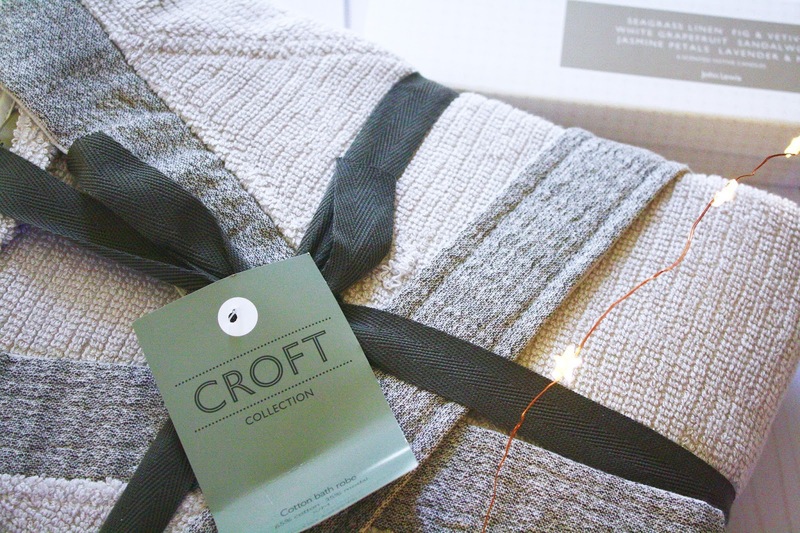 I'm so happy to have been able to add this to my sofa as it's such a cute addition... and it's ridiculously soft too. I received a few other items under the tree too including an incredible Zelda mug and Fenella Smith pug-themed mixing bowl from Alex and the most beautiful marbled vase from my Brother. 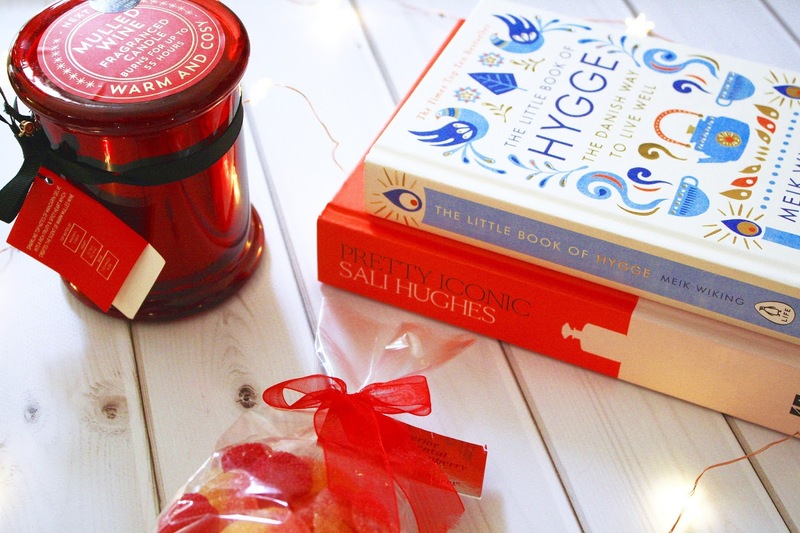 I am sure you will spot these items in my blog posts throughout the year as they're additions to the flat which I was very grateful to receive. I did receive another scarf too which eagle-eyed readers (...such as my Mum) may have spotted in my 'Stocking Fillers for Her' post. 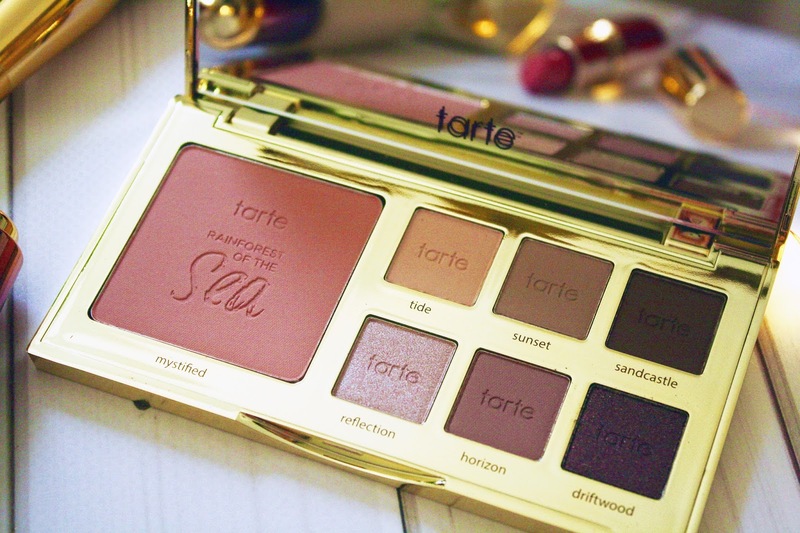 I was actually going to go out and buy the leopard print scarf myself after putting together the gift guide so I was super happy to have received this under the tree. It's so snuggly and really adds a pop of colour/texture to a plain outfit - and I'm happy to have finally hopped aboard the leopard print trend before that ship has sailed. This has made the inner 90s girl in me very happy. I hope that you have enjoyed this post, I know it was pretty darn photo and text-heavy so thank you if you've stuck with me until this point. 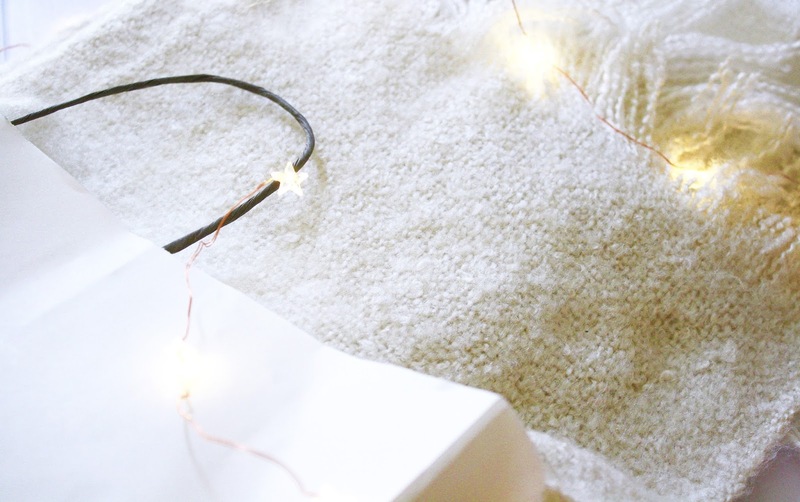 I'm so excited to start posting more content on my blog for 2017, although I will miss my blog home page being filled with Christmas lights and baubles in my photos. Alas, here's to 2017 and let's make it an incredible year!